Smock in Daytime | Mazy by Dylan M.
Home/Shop All/Dylan M, Mazy by Dylan M, Windham Fabrics, Shop All Fabrics, Cotton Fabric, Quilting Fabric, NEW!/Smock in Daytime | Mazy by Dylan M.
Home > Shop By Type > Cotton Fabric > Smock in Daytime | Mazy by Dylan M.
Cotton and Steel Basics come in an array of modern colors, and are perfect for your quilting patchwork projects! The Dottie print is simple, clean, and modern. From designers, Alexia Abegg, Melody Miller, Rashida Coleman Hale, Kim Kight, and Sarah Watts. Fable in Green | Wildwood by Rifle Paper Co. Wildwood by Rifle Paper Company is the sixth fabric collaboration between Anna Bond and Cotton and Steel Fabrics. 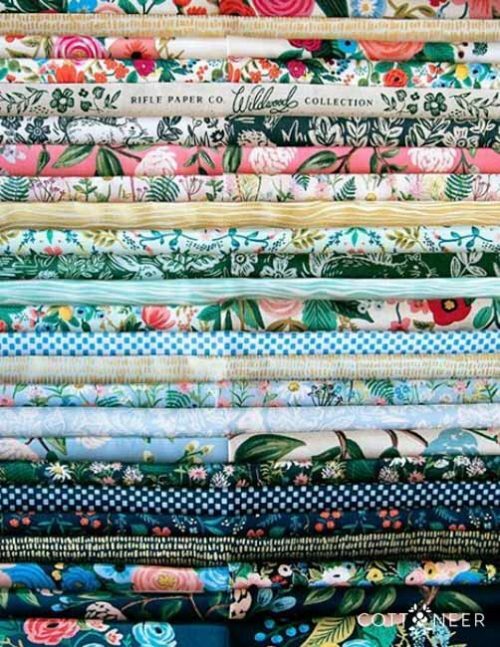 Featuring wildflowers and florals in the classic style that we've all come to know and love from Rifle Paper Co. We have the entire collection available to order in bundles and fat quarters! Mazy by Dylan M is a collection of 18 prints with the garden goddess in mind. From heirlooms tomatoes, to daisies, and a jaw-dropping floral fabric print, you'll find Mazy fabric is soul-soothing through and through. Mazy fabric by Dylan M is available by the yard and in yardage or fat quarter bundles at Cottoneer Fabrics!